Their main action is to cause luteolysls of a CL (Corpus Luteum), but it is important to highlight that newly formed CLs (less than 12 - 14 days old) are refractory to luteolytic effects of prostaglandins. Mammals have developed mechanisms to avoid having excessive concentrations of PGF2α in blood for unnecessary periods. Therefore, PGF2α is metabolised very rapidly after a single pass through the lungs. Thus, the short half-time of the natural PGF2α is in fact, a protective mechanism of the normal physiology developed by mammals . The natural PGF2α produced by the endometrium triggers a CL-induced Oxytocin release in mature CLs, which in turn will cause more PGF2α release from the endometrium and this self-sustained endocrine loop (Feedback loop, in blue in the picture shown below) will culminate in CL regression. Additionally, it has been recently demonstrated that PGF2α will induce a PGF2α production in the CL in another self-sustained loop (Auto-amplification loop, in red in the picture shown below). Prostaglandins can be natural like Enzaprost® T (dinoprost) or agonists like synthetic analogues. Synthetic versions have only limited action on the smooth muscles as this was considered to be a harmful side-effect when these synthetic PGF2α were originally developed. Synthetic compounds include cloprostenol and d-cloprostenol, luprostiol, etiproston, alfaprostol and others and they are normally dosed at 1 or 2 ml/sow. 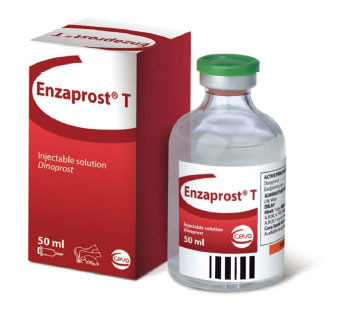 Enzaprost® T (dinoprost) is a natural prostaglandin so it has an enhanced action on the uterus with an equivalent luteolytic effect. Dinoprost is dosed at 2 ml/sow. 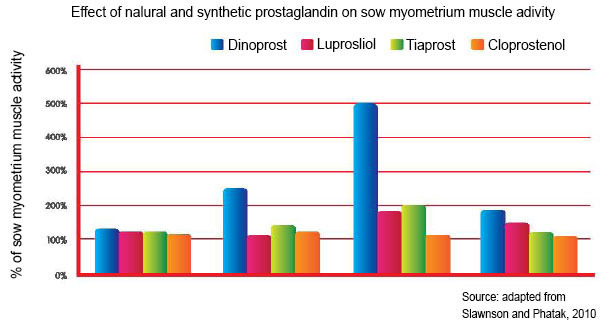 Enzaprost® T exerts greater activity than d-cloprostenol on both longitudinal and circular muscle of porcine myometrium during the luteal phase in an in vitro model [see graph below]. 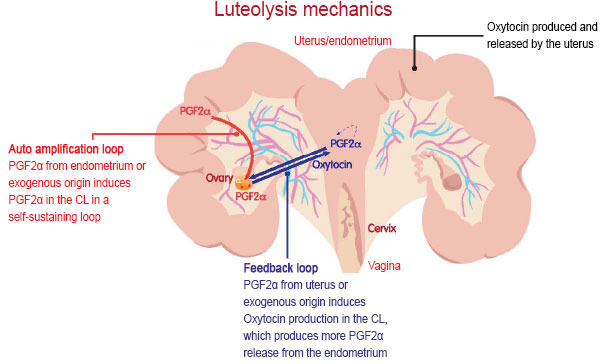 An in vivo study measuring intra-uterine pressure, dinoprost exerts greater uterotonic activity in all stages of the cycle particularly during dioestrous when there is an active corpus luteum. Interestingly, the enhanced activity of the natural PGF2α is thought to be related to its much greater binding affinity to myometrial and CL receptors than for synthetic analogues. This affinity has been reported to be roughly 10 times greater than dl-cloprostenol for myometrial cells and staggering 150 times greater than dl-cloprostenol for PGF2α receptors in CL cells . The active compound of Enzaprost® T is dinoprost, a tromethamine (organic buffered solution) salt of the native prostaglandin F2α. Prostaglandins (PGF2α) of uterine origin are necessary to cause CL regression in sows, which in tum will terminate pregnancy. Dinoprost has luteolytlc eflect (causing the regression of the CL) and uterotonic effect (including myometrium contraction) as the natural PGF2α. As an aid in the treatment of chronic metritis or pyometra (post-partum usel. 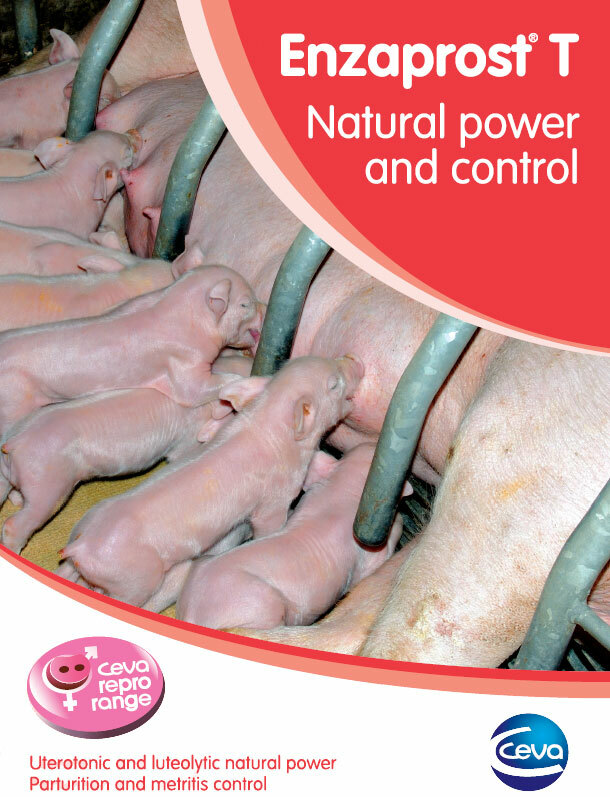 Treatment of sub-oestrus or silent heat in sows which have a functional Cl., but do not express behavioural oestrus. Induction of parturition (114 days). 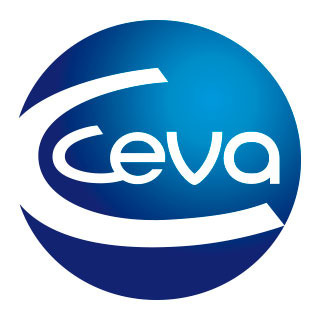 Two-fold advantage of Enzaprost" T: Improvement in WOI* and WSSI** (because a comparitive trial performed in Brittany in 1999 on 90 sows, with results were presented by Ceva Sante Animale showed the Weaning to Fertile Service Interval close to 5.3 days in the batch of sows treated with Enzaprost® T). 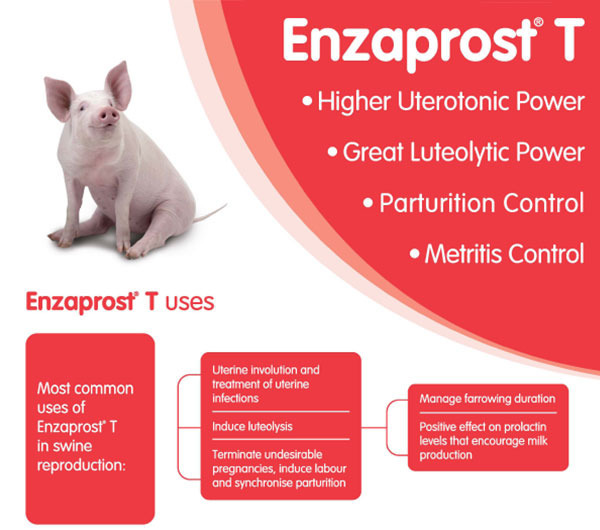 Enzaprost® T also stimulates the secretion and let down of milk, benefiting the offsprings. Composition Dinoprost 5 mg. Excipient q. s. 1 ml Indications Post-partum use: reduction of the weaning to oestrus interval (WOI) in sows with puerperal problems such as metritis in herds with reproductive problems. Contra-indications Do not administer to pregnant animals, unless it is desirable to induce parturition or interruption of pregnancy. Posology Post-partum use: One administration of 2 ml of Enzaprost® T per animal 24 to 36 hours after parturition. Special precautions Pregnant women, asthmatics and persons with bronchiol and other respiratory problems should use the product or wear disposable plastic gloves. Withdrawal period Meat and offal 2 days. Storage No special precautions for storage. After first opening, do not store above 25ºC. Packaging Vials of 5 ml, 10 ml, 30 ml and 50 ml. 1. Diaz, F.J., et al., Regulation of progesterone and prostaglandin F2α production in the CL. Molecular and Cellular endocrinology, 2002. 191: p.65-8BO. 2. Pate, J.l., c.J. Johnson-Larson, and J.S. Ottobre, life or Death Decisions in the Corpus Luteum. Reproduction in Domestic Animals, 2012. 47: p. 297-303.